So have you ever eaten 100% pure chocolate? I don't mean semi-sweetened, baker's, or even dark chocolate. I am talking unadulterated pure chocolate? Well I'll save you the trouble if you haven't: it's nasty. Like eating a raw coffee bean, only more bitter. And don't get me wrong, I like a dark chocolate. I typically have a bar of 88% chocolate working at all times. But I inadvertently grabbed a 100% bar the other day at the market, and am wondering what to do with it now. I can't give it to the dog (toxic), and even the squirrels looked at me like I was nuts when I tossed it out in the yard for them to munch on. I guess I'll just leave it out there until I hit it with the mower later this spring. Hey did you know that chocolate (known as cacao) dates back to at least 1900 BC? Yeah, it probably goes back a lot further, but evidence shows Mesoamericans eating it at least that far back. Later in the Aztec and Maya eras it was used not only as food, but as currency for paying tributes (taxes) to the high priests. Thing is, Mesoamerica lacked both milk fat and sugar. So they pretty much only knew the aforementioned pure version of what we consider a sweet. It's not surprising then that their word chocolate loosely translates to mean "bitter water" in our tongue. Even more peculiar, in its raw form it is inedible and can even be toxic to some people. The cacao pod is about the size of a football and is filled with a mucous-like slime and about 35 to 40 "beans". Yummy, huh? Once said pod falls off the tree upon which it grows, it needs to ferment in its own slime for a while. Then the beans are extracted from the glop, dried, and roasted. Only then do they become the inedibly "bitter water" the Aztecs so favored in food and beverage. Whoever figured all of this out was hungry, this much we know. But like a lot of New World crops, cacao was taken back to the Old World and turned into something completely different. Outside of Spain, it has rarely made its way into savory cooking at all. Instead it was mixed with sugar and later milk (thanks to the Swiss) and considered a dessert. But it wasn't until the 1800s that a fellow named named John Cadbury (yes, that Cadbury) figured out a way to blend the ingredients in such a way as to make the solid bar we all know today. Why he wasn't knighted for this, I'll never know. I mean, if you are going to knight Paul McCartney and Elton John, isn't the inventor of the chocolate bar a no-brainer? I'll never figure the British out. When chocolate came back to the Americas in its sweetened form, it was of course a big hit. Early U.S. chocolate factories had trouble keeping pace with the demand as more and more people acquired a sweet tooth for it. In 1894 a young man from rural Pennsylvania started just such a factory that would go on to make his name famous worldwide. I am of course referring to Milton S. Hershey, creator of the milk chocolate bar with his surname printed across the front of it. The Hershey Bar and the Hershey Kiss (invented in 1908) are probably two of the most iconic American candies ever brought to market. They've even made their way into outer space! Milton Hershey went on to lead the way in philanthropic endeavors as well, via The Hershey Trust Company and the Hershey School, both in the town bearing his name in Pennsylvania. You can visit both the Hershey factory and theme park from a timeshare rental at The Suites at Hershey. On the west coast of the U.S. an Italian immigrant with a hard-to-pronounce last name opened a chocolate factory in San Francisco in 1852 that remains in operation today. 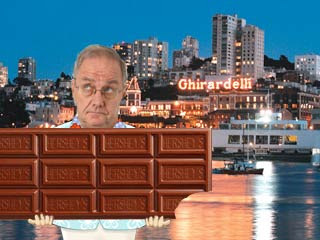 Domingo Ghirardelli came to San Francisco in 1849 with dreams of finding gold and striking it rich. The gold part didn't pan out (see what I did there? ), but like a lot of new immigrants, he took advantage of the boom and created a chocolate that has become famous the world over. He probably should have just called it Domingo's chocolate, but he wanted his last name on the bar, and to this day, Americans mangle its pronunciation. They ran an ad campaign for years with the phrase: "Say Gear-ar-delly!" but it didn't work, and almost no one gets it right. You can visit the factory in beautiful San Francisco from a timeshare at The Suites at Fisherman's Wharf; 2012 marks the 160th anniversary of the company and they have events planned throughout the year. Well, I am off to Assumption Catholic School in Houston, TX to catch the latest stop of the Think Big, Eat Smart Tour. No it's not another eating contest (although I do have one of those coming up). It is a 60-city promotional tour that helps children understand the proper use of chocolate and confections in their diet, and it features the largest chocolate bar in the world, as certified by Guinness. This thing is 21 feet long, 3 feet high, and weighs in at 12,190 lbs. That's over six tons folks. Are you kidding me?! Of course if they wanted to teach children about proper portion size, you'd think they'd have a really, really, small one. Perhaps it wouldn't draw the same crowds, but it would certainly be a lot cheaper to lug around the country.